Before I tell you anything about War of Rights, you should know that the pre-alpha footage for newly launched Kickstarter project at one point showcases a 20+ second reload time. Man, and I thought Killzone was bad. 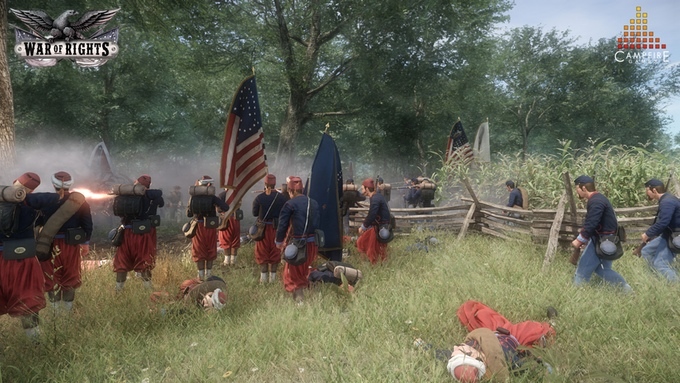 A multiplayer game based on the American Civil War, it’s striving for historical accuracy, and judging by that lengthy reload animation, it’s already got things down to a tee. Prospective backers have until the 14th of November to help the game reach its £70,000 funding goal. This marks the first Kickstarter project from Campfire Games. The CryEngine-powered War of Rights is set to feature two primary game modes: Historical Battle and Skirmishes. The former will focus on fighting over a large map, where as the latter will scale down the battlefield to key area. It’s also set to feature a range of cosmetic customisation options, so if you want to rock a well-waxed moustache, you’ll have plenty to choose from. Here are my impressions: I think War of Rights is offering something different enough that it stands a decent chance of getting made, and its funding goal isn’t out of reach. However, the emphasis on historical accuracy might be its undoing. There’s a reason we don’t say many pre-WW2 shooters – because they’re bound to be slow and tedious. That said, history buffs are sure to find something attractive about the prospect of slowly cleaning out a gun barrel as their comrades fall one by one. If that sounds like a party to you, you should head over to the game’s Kickstarter page by the 14th of November. Track the progress of the War of Rights Kickstarter in our Campaign Calendar.